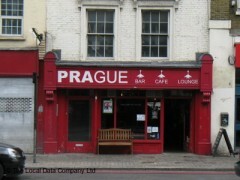 It’s not Prague, but with all the Czech beers on draught it’s as close as you’ll get in Shoreditch! About: Prague is a Czech bar/cafe/lounge with an extensive cocktail list, Czech beers and Cezch bar snacks. "It’s not Prague, but with all the Czech beers on draught it’s as close as you’ll get in Shoreditch!" Prague is a bar, café, lounge and all round hip place to be anytime of the day any day of the week. Its oxblood façade lights up the corner of Kingsland Road with a subtle come-on that’s in keeping with the relaxed atmosphere inside. It’s all set up to be that elusive continental bar that we all love so much and both on surface features and beyond, it successfully enamours. The exposed brickwork gives it the rough and ready look and old chesterfield sofas nestle snugly into its dim corners that are decorated with craftsy touches. Despite its fairly rigid layout, a rectangle lined with rows of tables, any seat in the house comes with a sense of intimate privacy helped by the low lighting and well-selected soundtrack. It’s just as good for groups of friends as it is for couples and despite its Shoreditch location there’s almost a beatnik feel to it.